The Professional Regulation Commission (PRC) and the Board for Civil Engineering released results of May 4-5, 2014 Civil Engineer (CE) board exam in 2 working days after the exam. On this page you'll find the complete list of passers, top 10 (topnotchers), top performing schools and performance of schools as results are released online on Wednesday, May 7, 2014. PRC announces that 1,862 out of 4,289 passed the Civil Engineer Licensure Examination. The examination was administered in the cities of Manila, Baguio, Cagayan de Oro, Cebu, Davao, Iloilo, Legazpi and Lucena. The members of the Board of Civil Engineering who gave exam are Engr. Apollo S. Enriquez, Chairman and Engr. Praxedes P. Bernardo, Member. CE board exam covers the following subjects: mathematics, surveying and transportation engineering and hydraulics and geotechnical engineering (May 4) and structural engineering and construction (May 5). 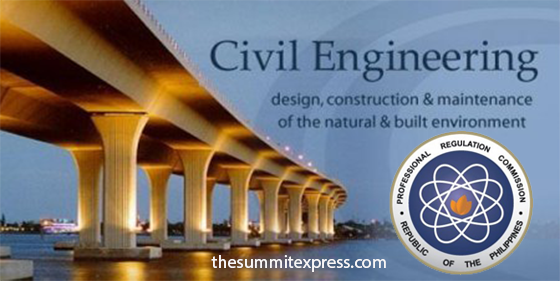 In May 2013, a total of 1,542 out of 3,601 passed the Civil Engineer Licensure Examination. Results were available online in (3) working days after the last day of examination. PRC named De La Salle University (DLSU)-Manila as the only top performing school for having 98.46% passing percentage. In November 2013 board exam, PRC named 3,168 out of 6,584 who passed the Civil Engineer board exam. The official results were also released in three (3) working days. University of the Philippines (UP)-Diliman, University of Santo Tomas (UST) and Technological University of the Philippines (TUP)-Manila were the top performing schools according to PRC.